Linoleum kitchen flooring has experienced a resurgence as new generations have rediscovered this durable, sustainable flooring. Often confused with vinyl flooring, there are actually few similarities between the two types of flooring. Instead, linoleum flooring has more in common with other environmentally friendly floorings like cork flooring and bamboo flooring. With the exception of a few color updates, the formula to make linoleum flooring remains largely unchanged. First patented by Frederick Walton in 1863, it is a combination of linseed oil, wood flour, tree resins, ground limestone, and cork dust. Pigments are added for color and then it is pressed into a jute backing. 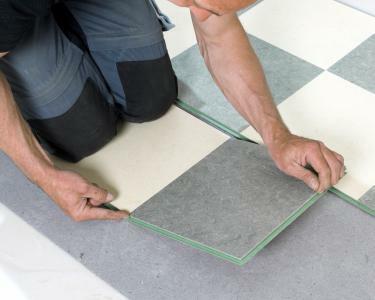 It is then cut into sheets or tiles before being installed. There are three main types of linoleum floors available to consumers. Tile: Linoleum tiles are often less expensive than other linoleum types but are also the least durable. Edges that curl upwards over time are the most common problem. These tiles often give the room an old fashioned appearance. Sheet: Sheet linoleum is the most popular type of linoleum. Inlaid linoleum floors, which are known for their beauty and durability, are made from sheet linoleum in a manner similar to those used to create inlaid wood floors. Rug: Actually a type of sheet linoleum, this old fashioned type of linoleum is most common in homes built before the turn of the century. In this case, the linoleum was printed with patterns and created to mimic a rug. It was attached to the floor by means of an adhesive. This type of linoleum has fallen out of fashion and is very difficult to find in current markets. The popularity of linoleum kitchen flooring declined when vinyl flooring was first introduced. Consumers preferred the brighter colors and more vivid patterns available with vinyl flooring, as well as the lowered cost. Now, with consumers more concerned with durability and environmental impact, linoleum is once again the preferred flooring material for many homeowners. Early linoleum was available in several earth tone colors, making many consumers consider it drab and old fashioned. New formulas combined with brighter pigments have eased many of these concerns, as the colors available have expanded greatly. There are also products such as marmoleum flooring, which are made to mimic a more expensive material. Although linoleum has always been more durable than vinyl flooring, new coatings and resins have increased linoleum's resistance to scratches and other imperfections. Linoleum is water resistant and highly resilient, reducing the chance that it could be permanently damaged. Patterns are not printed on the surface of the product, making wear less apparent. Linoleum is made from organic materials that are largely renewable. It is also non-allergenic, and therefore used in many hospitals and other health care facilities. Despite its durability, linoleum requires some basic maintenance to keep it looking as good as the day it was first installed. Homeowners should plan on cleaning it every week with water and a mop or a manufacturer approved cleaning solution. High traffic areas should be resealed once a year to further protect the floor because the material is porous. This can easily be accomplished by applying one to two coats of acrylic sealer. Chips or gashes in linoleum floor can easily be fixed. Just shave a bit off of an extra piece of linoleum and combine the shavings with some wood glue. This mixture can be used just like wood putty to fill the imperfection. Due to misconceptions about linoleum flooring, good research is key. Be sure to contact the manufacturer to get any questions answered before making a purchase. Also check that you are buying actual linoleum, not vinyl flooring. Installation can be difficult for professionals not accustomed to working with linoleum because it can stretch slightly during installation. Be sure to ask about any prospective contractor's experience with linoleum before hiring.